Over marketing en sales zijn vele boeken geschreven. Hieronder willen we je in het kort het verschil uitleggen in het Engels. Ook hebben we een lijstje bijgevoegd met bruikbare termen. Handig als je zakelijke gesprekken voert of moet onderhandelen over condities of prijzen. The job of sales is to “sell what we can offer or what is in stock”. A company will have specific products or services. The job of sales is to sell these products or services. With sales you can develop relationships with customers. You start with the initial talk, help your customers to make a decision, overcome objections, negotiate prices and terms and work to be sure that customers are happy with the product or service. Marketing = is an ongoing communications exchange and engagement, with customers in a way that educates, informs and builds a relationship over time, now and for the future. If nobody knows about your product or service there won’t be any sales. Markets are constantly changing. The job of marketing is to stay ahead of the changes and anticipate at the right time. Testing two versions of a marketing idea (webpage/CTA/newsletter etc.) to see which one performs best. Tracking data that informs you about your marketing efforts. The data can come from a website, social media, etc. Person or company that acts for another and provides a specified service. Everything that shows awareness of your business, your product or service that separates you from other businesses. Business to business e-commerce: use of commercial networks, online product catalogues, websites and other online resources to inform and reach new customers. Business to consumer e-commerce: online sale of goods and services directly to consumers via websites. The comparison of your products or services with that of competitors. The comparison can be focussed on price, service, delivery time etc. The number of people who land on a page of your website and leave without clicking on anything before moving on to another page on your site. Any person who makes a purchase or a person employed by the company to buy stock. A picture/summary of your ideal client. Based on demographic data. It helps salespeople to focus on the right prospect. Offer to pay back (part of) the purchase price of a product to customers. To call someone back in a later stage because it gives you more time to speak with them. Two or more shops or outlets that have the same owner and sell almost the same merchandise. Finalizes a sale or service. To call a prospect to get them interested in an appointment or product/service. The type of advertising in which a company makes a direct comparison to another brand, product, service or business. Small shop located near a residential area that opens long hours, often seven days a week. The course of actions that a prospect will go through to eventually become a lead. With the intention of a sale. All symbols, such as colours, letter type, logos, layout etc., that creates a public image of a business. The total (marketing) cost of acquiring a lead. Certificate or voucher that gives customers a saving when they purchase a specific product or service. Software that helps you organize all of your marketing and sales activities. Such as storing contact and client information, prospects and leads, sales, planning etc. A way to measure and calculate the cost of acquiring a customer. A profiling aspect to get specific information on age, income, family life, gender, social class, savings etc. of a group for marketing and advertising strategies. A large shop or store that carries a wide variety of product lines. To make an unexpected visit to a client or prospect. Buying and selling by electronic means, primarily on the internet via websites. A measurement of likes, shares, comments or any other form of interaction on a piece of content that is shared. Promotion of products and services over the internet often on social platforms. Maintain contact after a talk or sale to ensure customer satisfaction. Association between a company (franchiser) and an independent business person (franchisee) who buys the right to own and operate a unit or service in the franchise system. A promise that product will be repaired or replaced if faulty. A network that connects people to each other within a company. Advertising your company via content marketing, blogs, podcasts, E-books, email, video, social networks etc. rather than paid advertising. A way of entering a (foreign) market by joining with a foreign company to manufacture or market a product or service. A method to measure the performance of various factors based on your sales and marketing efforts. A prediction of the net profit attributed to the entire future relationship with a customer/company. The company with the largest market share in an industry. Percentage of the price added to the cost to reach a selling price. All the efforts of taking an existing product or service to a new market. Influential members of a community, group, business or society to whom others turn for advice, opinions, and views. Designing and producing the container or wrapper for a product. A group of products that are closely related and often are complementary. The net profit from a product or service after all costs for marketing and selling for that product or service are covered. Price, Product, Place and Promotion. A person who represents and sells a product or service for a company. A system to measure the profitability of an investment you make in sales, marketing, etc. A way to ensure that investments bring the results you want. A prospect or lead generated by someone who may have an interest in the product or service you’re selling. A process that leads your client through your products or services with the aim to get them interested. An exhibition at which companies in a specific industry can show or demonstrate their services or products. Something that differentiates a product or service from its competitors. The internet version of word-of-mouth marketing. If your product or service goes ‘viral’, it is shared on the internet. Wholesale To sell goods and services to those buying for resale (e.g. a shop) or for business use. Als je verkopen zijn gestegen kan je dat aangeven met ‘Sales increased by 20%’. Maar je kan ook synoniemen gebruiken. Sales increased by 25% last year. There was an increase in sales of 25% last year. Sales improved by 10% last month. Last month there was an improvement in sales of 10%. Sales grew by 15% last year. Last year there was a growth in European sales of 15%. Sales have been growing steadily over the last five years. Sales rose by 20% last year. There was a rise in sales of 20% last year. Sales climbed by 10% last year. Our sales climbed sharply last quarter. Sales surged by 25% last year. There was a surge in sales of 25% last year. We have seen a sharp surge in sales this year. Sales improved significantly last week. There was a significant increase in sales last week. Last year there was a dramatic improvement in sales. Sales have risen dramatically this month. We saw a steady rise in sales in the last two years. Sales went up by 30% in the last two years. 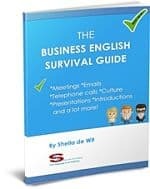 Zo je hebt een aantal Engelse termen voor Marketing and Sales die je gelijk kunt gaan gebruiken in je eerst volgende gesprek. Hier kun je nog meer zakelijke vocabulaire vinden die handig van pas komen in de gesprekken die je met klanten voert. Of bekijk deze Engels- Nederlandse woordenlijst die handig is als je internationaal zaken doet. Termen die je moet kennen. Je zal ook wel eens een presentatie moeten geven in het Engels. Bekijk dan ook dit stappenplan voor een perfecte presentatie.